Blake Oil and Gas Limited (Blake), with assistance from specialist A and D advisors, Envoi Limited, is seeking a company to partner in a Joint Venture development and exploration of its prospective oil and gas assets in the Kura Basin, onshore Georgia. The assets comprise three Production Sharing Contracts (PSCs) including existing production from the Ninotsminda Field, which also has undeveloped reserves, plus very large appraisal/development potential in the Manavi and Norio oil discoveries and upside in several large undrilled exploration leads. Independent reports by Oilfield Production Consultants (OPC) and Netherland, Sewell & Associates Inc. (NSAI) estimate that the three PSCs could contain total combined reserves and contingent resources of 835 MMBoe recoverable. Prior to 2010 the assets were owned by AMEX listed CanArgo Energy Corporation when a corporate reorganisation, following Chapter 11 in late 2009, led to new private ownership of their Georgian assets and refinancing by Blake in early 2010. Blake is now offering up to a 50% interest in its entire Georgian portfolio involving, firstly, purchase of an equity in the existing production of the Ninotsminda Field, including its upside that will be unlocked by the Phase I rehabilitation programme and Phase II drilling of the undeveloped parts of the field and; secondly, a drilling and seismic programme to appraise and develop both of the potentially very large oil discoveries contained in the Manavi and Norio structures. Commenting on the opportunity, Mike Lakin, Managing Director of Envoi said; “With improved stability and an increasingly commercial and western influenced political and business environment, Georgia represents a major investment opportunity with Blake’s highly prospective Kura Basin assets. These provide a unique mix of existing production, rehabilitation and upside development, plus appraisal drilling of two potentially very large discoveries. Blake’s new approach and search for a capable JV partner bringing proven expertise and new funds plus the most up to date, exploration, operational and drilling techniques will undoubtedly unlock the large potential of the underdeveloped and underexplored potential in its acreage. This is, therefore, an excellent opportunity for companies seeking a new focus area for their portfolio with existing cash flow and discoveries offering large upside but needing new initiative, expertise and funds, albeit in a region that has historically has been bypassed by many politically, but has since come of age, is now open for business and is ripe for new investment and participation by the right E&P company”. Multiple play potential distinguishes the petroleum geology of Georgia and Blake’s acreage within the Kura Basin; including the clastics within the Tertiary’s Neogene (consisting of the Miocene and Pliocene) and the underlying Palaeogene (including Eocene and Oligocene units which form the main proven producing reservoir in the Ninotsminda Field), plus the older and deeper sub-thrusted Mesozoic carbonates (the newest play which offers substantial upside in the Manavi discovery) as part of the Caucasus region. 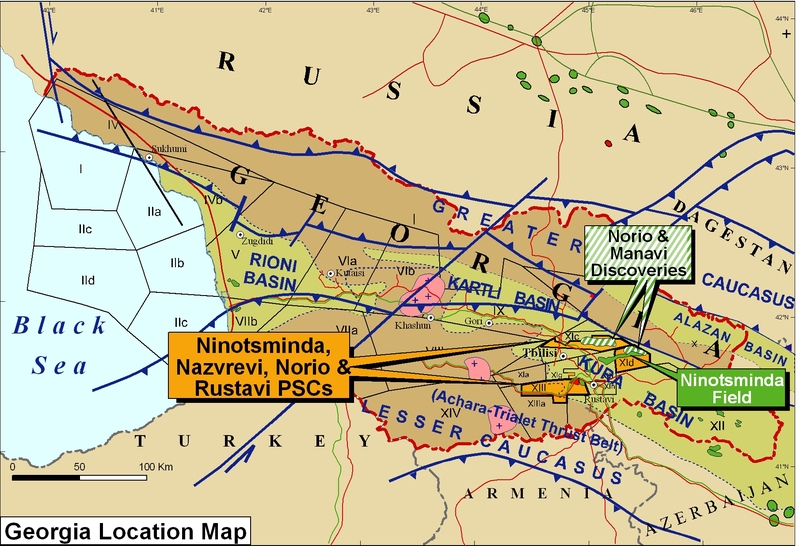 Manavi partly underlies the Ninotsminda Field and is significant as the first oil found in the deeper fractured Cretaceous carbonate reservoir in Georgia, although directly analogous to the prolific production in the 200+ existing proven/producing fields to the north in the southern provinces of Russia. This press release was distributed by ResponseSource Press Release Wire on behalf of Cobalt Media in the following categories: Business & Finance, Manufacturing, Engineering & Energy, for more information visit https://pressreleasewire.responsesource.com/about.